Naturall Glass cleaner is produced from natural ingredients including orange oils to help eliminate grime and dirt on glass and mirrors. Naturall Glass cleaner maintains high environmental standards while not compromising effectiveness. The orange oils, corn based ethanol and natural surfactants create a simple and effective cleaning tool for glass surfaces. 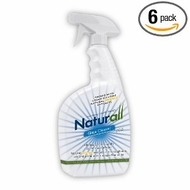 Try Naturall Glass Cleaner on your toughest glass cleaning challenges and see how it cleans with ease.